In a recent piece for the New York Times Magazine, journalist Janet Reitman laid out a case for why she believed the United States Marine Corps as an institution did not go far enough in protecting its recruits from incidents of hazing or brutality during recruit training at Marine Corps Recruit Depot, Parris Island. To be clear, the Marine Corps has a long history of failing to protect the recruits they are tasked with turning into Marines. This is especially true at Parris Island. There are numerous examples both recent and historic of Drill Instructors in various states of sobriety debasing both themselves and the Corps. That these instructors would place recruits into situations where their lives would be in danger is inexcusable. It is for that reason that I believe articles like this one are important both in the light they shine on this issue and for the accountability they push upon Marine leadership. Having said that, this article was poorly written. It was additionally filled with misleading statements that lacked context and pushed a false narrative. There are several things that are wrong with this passage. First, to describe the average Marine during WWII as “buff” is a complete fallacy. 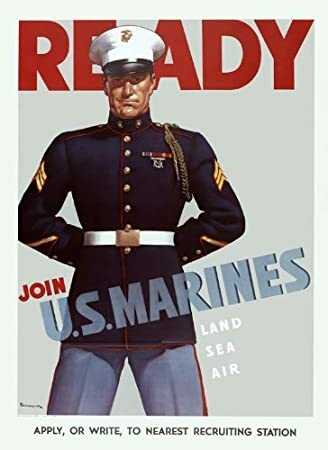 Sure if you were to look at Marine recruiting posters during that time period, you’ll see exactly what is described above. In reality however, the average enlisted male fighting in the American armed forces during WWII was 5'7" and 140lbs. Look at almost any photo of Marines during the war, and what will stand out to you is how young they are. Many were teenagers who joined before their eighteenth birthdays. It also struck me as odd to specifically call out how Marine’s during WWII were predominantly white. While this is true, the vast majority of individuals who filled infantry roles in the United States Armed Forces during WWII were in fact white. There are also specific examples that can be looked upon of minority Marines like Pappy Boyington who performed heroically during the war. Examples which I was taught while attending Marine Corps Officer Candidate School. Today 34% of the Marine Corps is composed of individuals who do not identify as white. Furthermore, to say that Marine’s today lack a resemblance of Marines of the past because they “roll into battle in armored Humvees or tanks, with sophisticated high-powered weaponry” is again, false. Marines throughout Operation Iraqi Freedom and today in Afghanistan, fight battles in a very traditional sense. In the Second Battle of Fallujah, Marine’s quite literally fought door to door, house to house, in close quarters with rifles and, yes, knives. While it is certainly true that Marine’s no longer fight primarily on or close to beaches, to insinuate that technology has somehow dramatically altered the way they fight all of their battles is simply wrong. If anything, recent history has shown us that an over-reliance on technology in war can lead to disaster. America’s invasion of Iraq was largely predicated on the notion that advances in technology could replace large numbers of traditional troops on the ground. We’re all aware of how well that experiment turned out. "I feel like they’re [Drill Instructors] really good at lying," says the lance corporal, who was sold on the corps by recruiting videos that presented the Marines as "badasses" on humanitarian missions to save refugees or deliver food and water. Reitman also goes on to specifically call out misleading statements recruiters made to Raheel Siddiqui during his enlistment process. The fact of the matter is, military recruiters lie. They give misleading statements to entice impressionable kids to join, and it’s a problem that’s systemic across not just the Marine Corps, but the entire American armed forces. Recruiters are under immense pressure to meet quotas, which itself can lead to a host of problems, and we should address this at a level that reaches beyond just the Marine Corps. Raheel Siddiqui, as described in this article, struck me as an individual determined to join the Marines no matter what. I’m not sure how much influence a recruiter could have actually had on him given his previously expressed enthusiasm, and the inclusion of the “lying recruiter” narrative in this article made little sense. “He [the Drill Instructor] lost his temper like crazy. Some days he’d be super motivating toward us," he says, "and then an hour later we’d be almost done for the day, and he’d walk in the squad bay and just flip out." The definition of acting is, “the art or profession of performing the role of a character.” To call Drill Instructors actors, which they are, and then to insinuate that their ability to quickly insert themselves into a character role somehow is indicative of an instability in their personality is misleading. Raheel’s platoon mate didn’t understand why Raheel had joined the Marines. Orders seemed to confound him. Rather than simply following them, he thought about what he was asked. "Like a normal person," the platoon mate says. "It’s not necessarily wrong, but it’s not how they wanted it. It’s wasn’t the Marine way of doing things." This earned Raheel, who always "looked like a scared animal," as his platoon mate says, undue attention from the D.I.s. The fact of the matter is, the purpose of Marine recruit training is not to create critical thinkers. The purpose is rather to create individuals who are loyal to the institution which they have joined and who will adhere to the orders that are given to them by their superiors. The Marine Corps is an organization that, while being equipped to accomplish many things, fundamentally exists to kill enemies of the United States. In a time of war, officers expect the individuals to which they are providing orders to execute those orders without question. If a Marine were to think critically about an order which has been given to them which would place them in harm’s way, any rational person would elect to take whatever action would remove them from harm. War however is not a rational thing. Every Marine officer is taught that their primary focuses are mission accomplishment and the welfare of their Marines, in that order. This is because in some cases, in order to accomplish a mission, Marines must die. To label Raheel as normal in this instance, while implying that the other Marine’s around him are not normal is misleading. Having read the article, I looked on Twitter to find what others were saying. In doing this, I came across the following tweet by Janet Reitman. In announcing this article to her followers, I found Janet’s sentiment odd. She did not take this opportunity to discuss how this article was an important step in holding the Marine Corps accountable. She did not mention at all Raheel Siddiqui, or the pain that had been inflicted upon him or his family. Rather, her tweet was simply about herself. It was about how this was her first piece in the New York Times Magazine, and how it was on the cover, and how it was good for her. While the issues Reitman discusses are important and need to be remedied, the misleading statements throughout this article undermine the author’s credibility and detract from the issue at hand. While undergoing training at Parris Island, recruits are only allowed to refer to themselves in the third person. The lesson this drives home is that no Marine is more important than the institution which they are seeking to serve, nor are they more important than the individuals around them. Perhaps Janet Reitman could learn something by reflecting upon that sentiment. Posted by Patrick Dugan on June 09, 2017 .